Can I Take My Pet on a Cruise Ship? Question: Are pets allowed on cruise ships? Can I take my pet on a cruise vacation? People love their pets and often wonder why dogs, cats, and other pet animals are not allowed on cruise ships. You can take your pet on other forms of public transportation, so why can't you take your favorite pet on a cruise? Cruise ships cannot accommodate pets for two simple reasons. First, pets have to have somewhere to sleep, exercise, and (most importantly) relieve themselves. Cruise ships have very strict sanitation and health codes, and meeting these codes prohibits ships from allowing pets onboard. This important issue will likely not be resolved anytime in the near future. Second, cruise ships almost always sail to ports in more than one country. Many of these countries have strict quarantine and entry requirements for any animals entering the country, even if they never left the ship. You might have to leave your pet behind at the first port of call! There is an exception to this rule. One cruise line, Cunard, does allow dogs and cats (no birds) on certain transatlantic cruises on the Queen Mary 2 (QM2), but many restrictions apply and space is limited and expensive. This is only possible if the transatlantic voyages do not have any ports of call. Although there are many requirements and restrictions, the kennels are so popular that Cunard started with a dozen kennels and added ten more during the refurbishment of the Queen Mary 2 in June 2016. A full time kennel master is responsible for the air-conditioned kennels on the QM2, and Cunard Line has a list of FAQs on Kennels and Requirements for Pets on their Web site. The kennels and adjacent indoor and outdoor walking areas are open during certain hours to passengers who want to spend time with their pet in this restricted area. Pets are never allowed in the cabins or outside the kennel area. Reservations for the kennels may be made at time of booking, and are based on space availability. Kennel fees for dogs start at $800, and cats require two kennels (one for the litterbox), so fees for them start at $1600. selection of premium pet foods from top brands. Cunard Line's pet-friendly policy dates back to the maiden voyage of the Britannia in 1840, when three cats were on board. Since then, circus elephants, canaries, a monkey and even a boa constrictor have traveled with Cunard. 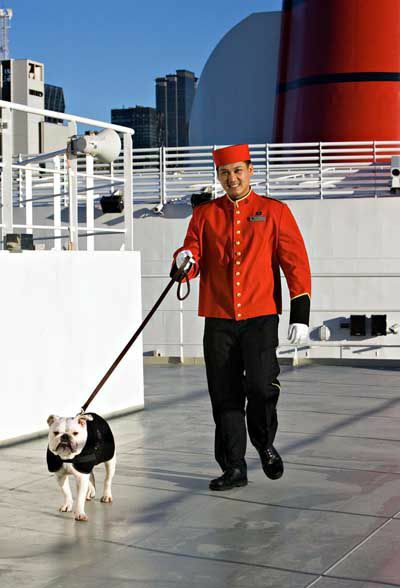 According to Cunard records, even some famous animals and celebrity pets have cruised with Cunard. Mr. Ramshaw, the world's only trained golden eagle, made at least 21 transatlantic crossings on mid 20th-century liners; Rin-Tin-Tin, star of 36 silent films, traveled on the Berengaria; and Tom Mix and his horseTony, stars of the 1930’s western series "Miracle Rider," regularly sailed with Cunard. Tony’s hooves were even fitted with special rubber shoes to prevent the horse from slipping on the gangway and decks. In the 1950s, Elizabeth Taylor brought her dogs on board the original Queen Mary and exercised them regularly on the ship's sports deck. She even ordered special meals for them from the fish chef. The Duke and Duchess of Windsor also traveled with a beloved pup and, at the Duke's behest, Cunard installed a lamp post beside the kennels. Anyone who has had a pet of any kind understands that pets are important family members. However, despite how much we love our pets, they are usually better off left at home. The strangeness of a cruise ship might scare even the most mild-mannered, well-adjusted pet. Even on the QM2, you aren't able to see your pet constantly or have it sleep in your cabin. In addition, you are on a cruise to have fun with your friends and family. The best solution - find a good kennel or pet sitter for your animal, and they'll have a great staycation while you enjoy your cruise!